If making homemade sausage, combine the meat with the wine and seasonings and chill for several hours or overnight before using in order for the flavors to combine. Heat the olive oil in a Dutch oven or deep skillet over medium-high heat. Add the sausage and brown and crumble the meat. Add the onion, garlic and rosemary and cook to soften the onion, 5-6 minutes. Add the chestnuts and stir for a minute more; add the wine and deglaze the pan. Stir in the stock, then the tomatoes, breaking them up with a spoon. Reduce the heat and simmer for 20-30 minutes at a low bubble. Bring the pasta water to a full boil. Salt the water and cook the pasta to al dente. Add a cup of the starchy cooking water to the sauce just before draining the pasta, then combine the pasta with the sauce. Serve in shallow bowls topped with Parmigiano cheese. In Recipes-list.com we have selected the most viewed recipes from category - uncategorized . Enjoy the best recipes specially selected for you! 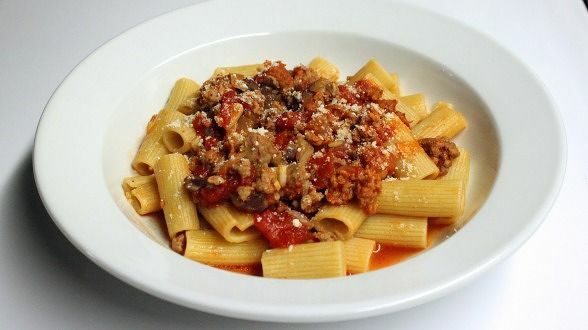 Hot Sausage Ragu is the right choice that will satisfy all your claims.